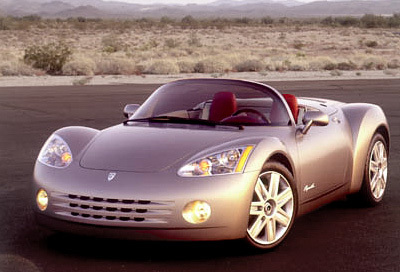 The Plymouth Pronto Spyder was a 2 door roadster concept which was introduced at the 1998 Detroit Motor Show. 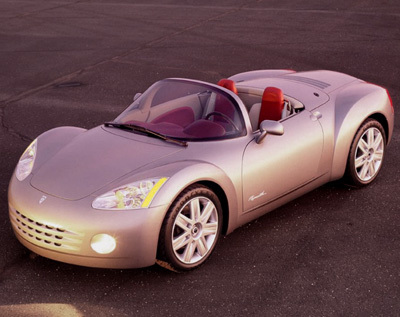 The Pronto Spyder was designed to be a lightweight, low cost, sports car with classic European styling cues. In order to help keep the final cost of the Pronto Spyder down the designers and engineers looked into cheaper manufacturing methods and materials. The result is that the Pronto Spyder features plastic polyethylene terephthalate (PET) body panels. This is the same type of plastic used for making soda or water bottles. Because of the inexpensive bodywork there was extra money left over in the budget for the drivetrain. 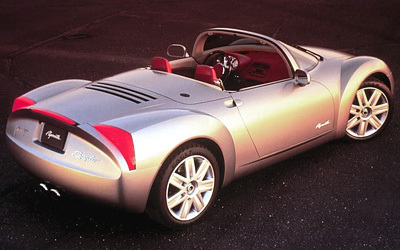 Powering the Plymouth Pronto Spyder was a mid-mounted, 225 horsepower, dual overhead cam, 2.4 litre, 4 cylinder engine connected to a 5 speed manual transmission. 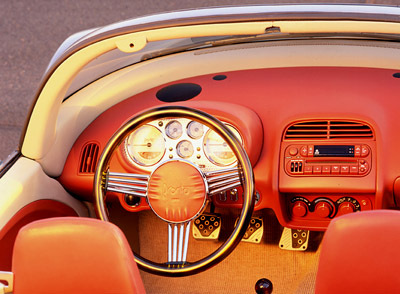 The red colored interior of the Plymouth Pronto Spyder was in stark contrast to the silvery-gray exterior color. It featured a plastic faux-turtle shell steering wheel which was later used on the Chrysler 300C, and a classic instrument panel layout.